Welcome to the website of Jim Franklin, master performer of the shakuhachi flute, the bamboo flute from Japan. On 24. 11. 2018 Jim Franklin and Hiroko Sugino played a concert (not classical!) at the Theremin-Academy Lippstadt 2018: shakuhachi * 2, live-electronics * 2 and theremin * 1 (2 performers). A complete video recording of the concert can be found here (https://youtu.be/Aw11FMeJo08). The ESS Summer School 2019 will be held 25. - 28. 07. 2019 in Lisbon, Portugal, at FUNDAÇÃO ORIENTE. Jim Franklin will be teaching and performing there. Further information will be posted on the ESS-Website. The third and final round of the Kokusai Shakuhachi Kenshukan Europe Scholarship for shakuhachi studies in Japan was formally announced in mid-October, with application deadline 31.01.2019. Further information can be found here. Dr Jim Franklin is a master performer of the shakuhachi, as well as a composer. He studied the shakuhachi with Riley Lee in Sydney, and Furuya Teruo and Yokoyama Katsuya in Tokyo. In 1996 he received the title "Shihan" (Master) from Yokoyama-sensei. He is one of the few non-Japanese, and the very few residents of Europe, to have received this high title. In 2018 he was Programme Director of the World Shakuhachi Festival in London. He has lived in Germany since 2004, where he teaches and performs the shakuhachi. 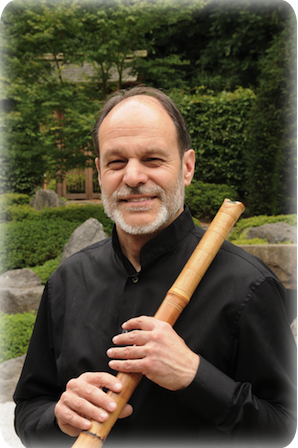 Jim Franklin is a qualified teacher of shakuhachi, in the lineage of Yokoyama Katsuya. He offers instruction for beginners and advanced players in various German cities. KSK Europe is planning further workshops during 2019. Further information can be found here.